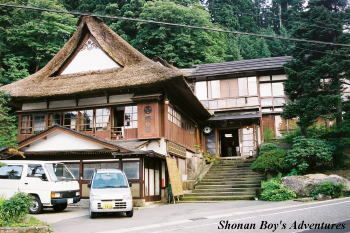 I had thought I wanted to go to Shirabu hotspring (Shirabu onsen), and stay Japanese long-established inn. Japanese inn is called "Ryokan". And I could make a trip there with my Dutch friend as he needed to visit near there for his business trip. From Tokyo to Yonezawa, we took the "Tsubasa" super express of the Yamagata Shinkansen. This train runs Tohoku Shinkansen (high speed line) between Tokyo and Fukushima, then runs straight through into the Ouu line of present line. The Ouu line this train runs is called the Yamagata line. Shinkansen cars of standard size are 25 meters long per car. They cannot go through present line because cars on present lines are 20 meters long and narrow body (almost same size as the Eurostar). So cars of Yamagata Shinkansen are the same size as the cars of present line. It is called "Mini Shinkansen". On the present line of JR, rail gauge is narrow. That is why it was changed into standard rail gauge on the Yamagata line. Comparing with Shinkansen, this train is shaken when it runs on Yamagata line. Between Fukushima and Yonezawa, it curves in mountain area, and climbs mountains. In the past, in this area, there were some switchback stations. They were changed into stations that is not switchback after the Yamagata Shinkansen is opened, because recent trains accelerate well. Though it runs at 130 km/h (about 81 mph), it is slower than other area on Yamagata line. But I thought it was good to eat a box lunch selled in the train or at the station, in the train. Our appetite will be increasing in the train. Box lunch is also Japanese culture. The box lunch selled at the station is called "Eki-ben". After we arrived at Yonezawa station. We went toward Shirabu onsen by bus. Yonezawa is famous for Uesugi, Yozan (born on 20 July 1751, 1751-1802, the 10th feudal president of the then Yonezawa feudal clan). He promoted education (schools and medical school) and industry (sericultural industry, textile manufacture, new rice field), and changed poor feudal clan into good one. He consider next era, and brought up people very much. So during the big famine of the Temmei, no one was dead because of starvation in Yonezawa. He is the person who should be respected especially at present in Japan. Education is treasure! John F Kennedy said Uesugi was the person who could be respected in the Japanese best. 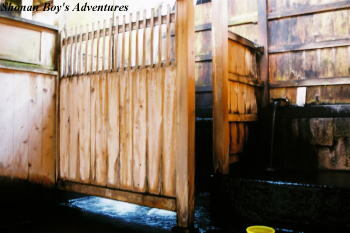 In 1300's, the hotspring began to flow out in Shirabu. It is located in 820 - 900 meters high (2690 - 2953 feet high) above sea level in the mountain area, and there are some Japanese style inns. It takes about 40 minutes by bus from Yonezawa station to Shirabu onsen (hotspring) bus stop. We got off at Shirabu onsen, and proceed to a inn "Nishiya Ryokan" by this bus stop. This inn was established about 200 years ago. It was the first time to stay Japanese long-established inn with thatched roof. There a Japanese style hearth near reception, and it is elegant. 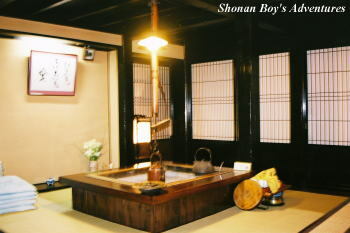 When the guests enter Ryokan, they should take off their shoes at most of the Ryokan. After check-in, we met an owner Mr. Endo. My Dutch friend and I talked with him in English. 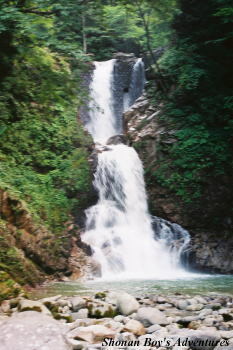 When we asked some sightseeing spots (Shirabu waterfall, Tengendai) around Shirabu onsen, he explain it in English in his pain. And I asked him in Japanese, "From this inn to Shirabu waterfall, will it take us about 10 minutes?" He looked at me, and said, "Oh, you are the Japanese! I thought you were the Hawaiian because you have a good tan!" And we laughed each other very much. But I cannot believe it because I think the Hawaiian do not look like me. 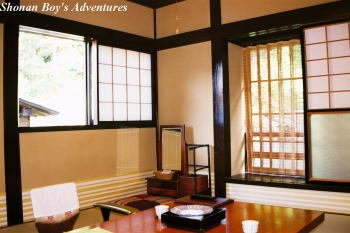 All the rooms in this inn are also pure Japanese style. Guests can choose the place where they want to eat, their room or other room. Cuisines of this inn are very good for price, and my friend also ate all of it. Of course Yonezawa beef is served. I heard that foreigners stayed here for the purpose of experiencing Japanese culture. This inn has a reputation for offering good service as it is small inn particularly. Bathroom in this Ryokan is old-fashioned. Japanese people like to bathe hotspring bathroom very much, as well my Dutch friend likes it. Whenever he came to Japan, he enjoyed it over and over again for one night. After we sweated, we enjoyed bathing. We felt better after bathing. During our bathing, I talked with one guest. He said he came there every year. There are many hotsprings in Japan. Trip of hotspring cure is also Japanese culture. 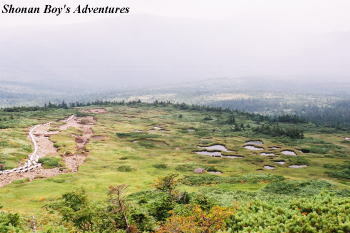 In a sense, there are many sightseeing spots in Japan. When we bathe, we should take off all clothes. After boarding lift of 3 portions, we enjoyed hiking. 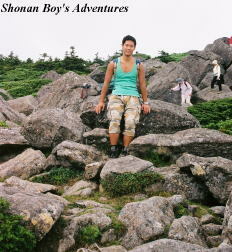 It is easy for the beginners to enjoy hiking in Tengendai highland. I saw young people and very old people with group. 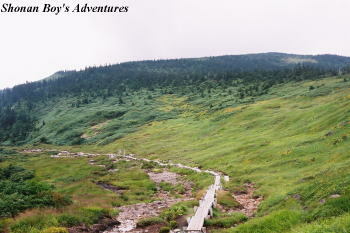 We arrived at Bounden rocks (2005 meter high above sea level) of Nissho-alumna mountain, and turned back. This time we could relax very much. Since then, my friend stays at Ryokan whenever he goes to Yonezawa for his business trip.